Home > Blog > Amy Campbell > Pasta: To Eat, or Not to Eat? One of my favorite foods is pasta. I think I could eat pasta every day and never tire of it. And when I’ve had a rough day, nothing comforts me as much as a plate of pasta with butter (or trans-fat-free margarine), Parmesan cheese, and freshly ground black pepper. Yet pasta is much maligned in the diabetes world. I’ve noticed that people who have diabetes become very passionate when discussing this food. There’s the camp that is indignant at the idea that pasta even exists — it spikes up blood glucose, causes weight gain, and may just be responsible for global warming (OK, that’s an exaggeration). There’s another camp who still eats pasta, but feels horribly guilty for doing so, and will swear with their right hand in the air that, “I really only ate a half a cup” (and 99% of the time, it’s just not the case). If you dine in an Italian restaurant and manage to clean your plate, you’ll consume even more carbohydrate and calories. When you look at pasta this way, it’s understandable that this food is viewed as part of the evil empire. Dietitians aren’t really supposed to relay the message that some foods are just, well, bad. But some probably are, like deep-fried Snickers bars or the fried, breaded onions that are so popular at steak houses. Pasta isn’t bad, though. It’s how you approach it. There really are some redeeming nutritional qualities to pasta, too. Pasta is a fuel. Pasta is mostly carbohydrate, the fuel source for the body. Why do you think Boston marathoners chow down on a pasta meal the night before the big day? The body needs carbohydrate for energy. Pasta is low in sodium. Sure, the sauce may be riddled with salt, but the pasta isn’t. Pasta is low in fat and saturated fat. Yes, it’s true. But all bets are off when you smother your noodles with Alfredo sauce, so skip that idea. Pasta has a low glycemic index. Unlike white bread or potatoes, pasta is pretty low in terms of its glycemic impact. The issue, of course, is the portion: Eating too much of any carbohydrate food will raise blood glucose. Pasta is sometimes enriched with B vitamins and iron. B vitamins help the body use its energy more efficiently. Iron carries oxygen around the body, among other things. A serving of pasta, which is one carbohydrate choice (15 grams of carbohydrate), is one-third of a cup of cooked pasta. That’s barely enough for a squirrel. But unless you’re on an ultra-low-carb diet (hopefully you’re not), chances are that you have more than 15 grams of carbohydrate to “spend” at your meal. So, if your carbohydrate goal for supper is 45 grams, you can have 1 cup of pasta. 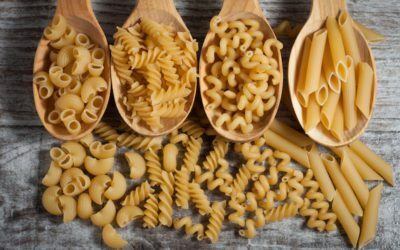 Granted, if you spend your carbs on pasta, it doesn’t leave much room for bread, fruit, milk, or dessert. For this reason, it’s not hard to understand why some people just avoid it altogether. Try a lower-carbohydrate pasta. Dreamfields pasta is one example of a lower-carb pasta; this contains more fiber (in the form of inulin) and protein than traditional pasta. The company claims that 2 ounces (roughly 1 to 1 ½ cups cooked) contains just 5 digestible grams of carbohydrate, so there’s no glucose spike after eating it. My advice is to try it and then check your blood glucose 2–3 hours later and see how it works for you. Barilla ProteinPLUS and Ronzoni’s Healthy Harvest are not exactly low-carb, but they contain whole grains (Barilla ProteinPLUS also contains legumes), which may be better for your glucose. Mix in veggies. Bulk up your pasta and “dilute” the carbs by mixing in vegetables. A pasta primavera dish is an example of adding a lot of veggies to a little pasta. Eat it as a side. 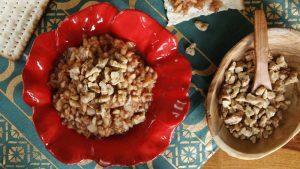 Grain foods should take up about quarter of the plate. Do away with the notion that pasta has to be the star of the meal. Squash it. Spaghetti squash it, that is. Mix in cooked spaghetti squash (which looks like vermicelli when shredded) to cooked pasta and top with your favorite (low-fat) sauce. Cook it al dente. Overcooked pasta has a higher glycemic index, meaning that it can raise your blood glucose higher than if you cooked it al dente (which literally means “to the tooth”). Al dente pasta is somewhat chewy, but never mushy. Despite all of this, you may decide that pasta just can’t be part of your eating plan. And that’s always your choice. But for those who need their fettuccine fix, I hope this is helpful. Do you have tips for eating pasta that you’d like to share? If so, please do! I’m sure our readers would be interested. Does this post have you in the mood for some pasta? Try our diabetes-friendly Shrimp Caprese Pasta, Italian Pasta Soup with Fennel, Bow Tie Pasta with Arugula and Feta, or Pasta with Spinach and Ricotta.